If you're unfamiliar with Detroit's Lafayette Park, the singular, mid-century modern neighborhood just east of Greektown, you're not alone. 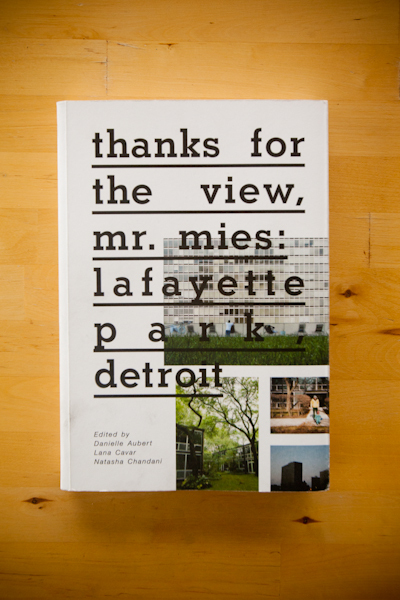 Thanks for the View, Mr. Mies: Lafayette Park, Detroit, an indispensable new book about what it means to live there, includes an elegant essay by resident Marsha Music in which she describes the neighborhood as "hidden in plain sight." Music's phrase is also a reference to Lafayette Park's relatively low profile in architectural and design circles worldwide. Though it isn't mentioned much, much about the development is notable. There are Mies' buildings, of course, the largest single collection in the world (take that, Lakeshore Drive!). Then there's the work by the other members of the design dream team who were brought to Detroit from IIT in Chicago to execute the park: planner Ludwig Hilberseimer, who oriented the entire development around the 19-acre, prairie style Lafayette Plaisance, and landscape architect Alfred Caldwell, whose contributions, including the park, have grown over the years into a lush, "absurdly bucolic" urban environment. Lafayette Park is, in fact, the most fully realized "settlement unit" mutually envisioned by these three designer-philosophers in the world. There's also the fact that, depending on who tells it, Lafayette Park is either one of the only successful urban renewal projects in the county, or the sole example. It was intended to keep the middle class in the city, and for one neighborhood, anyway, it did (at the terrible expense, it should never be forgotten, of Black Bottom, the densely populated black neighborhood that was razed to make room for it). It also realizes a great dream of modernism: in addition to being racially integrated from the very beginning, the houses have remained affordable for middle class buyers for decades. The rental apartments, meanwhile, are a steal, giving working-class people and young professionals the opportunity to live in buildings whose pedigree -- not to mention floor to ceiling windows -- would make them off-limits in any other city. (Except maybe Newark.) I've been a high rise resident for more than four years, and I still sometimes feel like the Mies Police are going to show up any day now, check my tax bracket, and tell me to start packing.